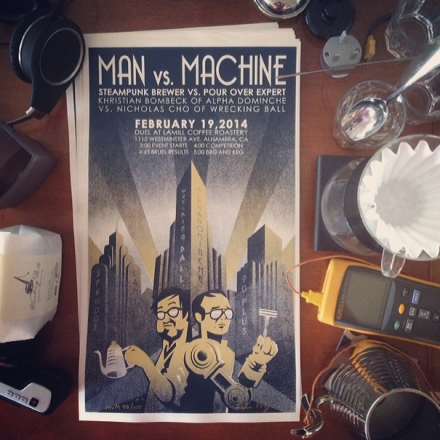 Man Versus Machine - Who Will Win The Coffee Battle For Tomorrow's Future? USA Today Publishes 10 Best Cr..
Take A Chance On Me: Budin Bri..
Man Versus Machine – Who Will Win The Coffee Battle For Tomorrow’s Future? In 1997, an IBM chess-playing supercomputer known as Deep Blue battled the two-time World Champion Chess Player Garry Kasparov. With human intervention between games, Deep Blue successfully beat Mr. Kasparov, who later accused IBM of cheating. It was a defining moment in computing capabilities and artificial intelligence trumping that of man. Tomorrow in Alhambra, California, a similarly historic battle will take place between man and machine, meat bag versus automaton. Wrecking Ball Coffee‘s Nick Cho versus the Alpha Dominche Steampunk. It’s a grudge-match between manually brewed coffee and automatic brewed coffee. Whose will taste better? Will Man win because he can express the one thing computers can’t—love? We announced this event late last month and since then, La Colombe owner and Eastern Regional Brewers Cup Champion Todd Carmichael has been brought on to assist the Alpha Dominche Steampunk brewer. The organizers also tapped legendary The Coffee Brewing Handbook: A Systematic Guide To Brewing Coffee author and former Coffee Quality Institute Executive Director Ted Lingle to judge the whole event. Five pounds of each coffee (in one pound bags) were delivered to each competitor by the 13th of February. 2:30 p.m. – Competitors will meet and mix their respective competition coffee into a bowl. 200 grams of each coffee will be placed into ten “100 Gram Competition Tins” and set on the COFFEE TABLE. The remaining weight of each coffee will be divided in half and given to each competitor for “warm up”. 3:00 p.m. – Official warm up starts. 3:40 p.m. – Competitors must remove all coffee from their brewing area. 3:45 p.m. – Competitors will take one “100 Gram Competition Tin” of each coffee from the COFFEE TABLE. 3:50 p.m. – Competitors can pre-dose (but not grind) coffee from competition. 4:00 p.m. – Battle starts, grinding of competition coffee can begin. 4:14 p.m. – Battle is complete; no more coffee can be picked up from the competition tables. – “Brewing Device” definitions will not apply to the Steampunk. – 5 different coffees brewed and served within a 14 minute total competition time (no pre-grinding, but water-prep okay). – 60 minute offical warm-up and preparation time. – Prior to the start of the competition, each competitor will pre-determine a target TDS for each of the five coffee brews. To judge consistency, final cup TDS should be within a range of ±0.10% brew strength of that target. If a cup’s TDS reads beyond that range, that cup will receive a score penalty equal to the % that the sample exceeds the range, multiplied by ten (e.g., If the target was 1.35%, and therefore the range is 1.25-1.45%, but the cup was 1.56%, that exceeds the range by 0.11 and will receive a penalty of 1.1 points). – Coffee preparations will be single brews of a minimum of 13 oz. (384 mL) that will then be separated in to three 4 oz. samples, one for each respective Judge. -Coffees must be brewed in the order stated above. -Judges will each be served approximately 4 oz. (118 mL) of each competitor’s coffee, served in identical cups (total of fifteen cups), and marked with alphanumeric codes. -When a competitor is finished with a brew, he will signal Attendant #1 to take his decanter of competition brew to the Brew Service Table where Attendant #2 will reside. Attendant #2 will then fill a flight tray, consisting of three (4 oz. sample) cups from the competitor’s brew. Attendant #2 will then signal Attendant #3 that the flight tray is ready and Attendant #3 will transport the flight tray from the Brew Service Table to the judging area where he will serve a 4 oz. (118 mL) coffee sample to each Judge. Join us tomorrow for this momentous historic event. Battle commences at 3pm at LAMILL in Alhambra (1112 Westminister Ave. Alhambra, California). Attendance is free, and guests will be treated to BBQ and beer in addition to the proceedings.